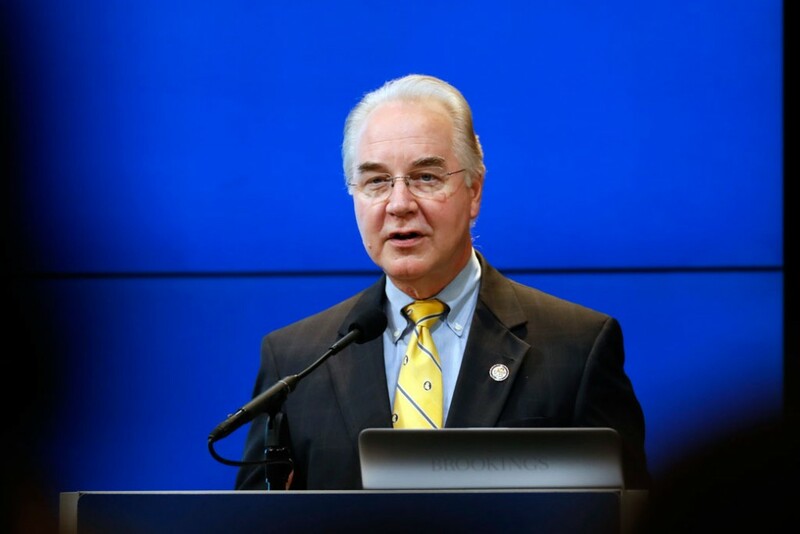 Just one day after President-elect Donald Trump nominated Rep. Tom Price (R-GA) to be secretary of health and human services, Rep. Price—who currently chairs the House Budget Committee—released a new agenda that would enable automatic across-the-board cuts to Social Security, Medicare, Medicaid, and other programs for low- and middle-income Americans. Rep. Price calls this “budget process reform.” In fact, Rep. Price is using the arcane language of budget process to obscure how these cuts would harm American families and rig the system to slash key social programs without requiring Congress or the president to take responsibility for the result. If Congress enacts President-elect Trump’s proposed tax plan—which mostly benefits the wealthiest Americans—then Rep. Price’s automatic cuts would slash Social Security by $1.7 trillion and Medicare by $1.1 trillion over 10 years. Rep. Price proposes “long-term debt limits” that would trigger automatic cuts to almost all federal programs—including Social Security, Medicare, and Medicaid—if the debt is not on track to meet the required levels in a given year. The president and Congress would not have to agree to a plan for achieving these fiscal goals when they establish a debt limit. Lawmakers would only have to vote in favor of reducing the national debt. Rep. Price’s automatic cuts provide a way for members of Congress to vote for both tax cuts and debt reduction—and for President-elect Trump to sign these measures into law—while falsely claiming to uphold campaign pledges to protect Social Security and Medicare. Despite evidence to the contrary, President-elect Trump will likely continue to claim that massive economic growth will keep the national debt under the limits set by Congress without the need for automatic cuts. But history has shown that trickle-down tax cuts do not grow the economy, with careful studies finding no evidence that tax cuts by Presidents Ronald Reagan and George W. Bush boosted long-term economic growth. These calculations significantly understate the damage that Rep. Price’s automatic cuts would do. A 13.5 percent across the board cut would only be sufficient to offset the cost of President-elect Trump’s tax plan, but Rep. Price would require significantly more spending cuts to achieve his goal of reducing the national debt as a share of the economy. If Congress enacts the military spending increases proposed by President-elect Trump, then domestic programs would have to absorb even deeper cuts. In addition to Social Security, Medicare, and Medicaid, these cuts would reduce nutrition assistance, education, and other programs for low- and middle-income Americans that have been proven to help grow the economy. It is important to remember that lives and livelihoods are at stake. Social Security keeps 22 million Americans out of poverty and provides retirement security, life insurance, and disability protection for nearly all American workers. Medicare and Medicaid provide health insurance to one-third of Americans. Almost all congressional Republicans—including Rep. Price—have essentially sworn to oppose any bipartisan deficit reduction agreement by signing a pledge to oppose any tax increases, even as part of a compromise that also includes spending cuts. Furthermore, Leader McConnell and Speaker of the House Paul Ryan (R-WI) already support raising the retirement age for Social Security—which is equivalent to an across-the-board benefit cut—so they may view Rep. Price’s cuts as a positive outcome. Rep. Price says his process changes would “take control” of the federal budget, but lawmakers can already pass laws to change taxes and spending, including for programs such as Social Security and Medicare that are not funded by annual appropriations bills. Lawmakers exercised this power in 2010 when they passed the Affordable Care Act, which included major reforms to increase efficiency and reduce spending in federal health programs. It is not the process but the public’s strong disapproval of cutting Social Security, Medicare, and Medicaid that so far has kept politicians from making harmful cuts to these programs. Lawmakers would be ceding control of the federal budget by implementing automatic across-the-board cuts, but that may be the point. President-elect Trump himself stated in 2011 that supporting the Ryan budget was “political suicide” because of its cuts to Medicare. Rep. Price’s budget process changes provide a way to cut programs such as Medicare without having to sign specific cuts into law. If American leaders want to cut crucial programs for low- and middle-income Americans, they should have a clear debate and vote on doing so, instead of hiding behind a budget process designed to shield unpopular choices from voters. Harry Stein is the Director of Fiscal Policy at the Center for American Progress. Alex Rowell is a Research Assistant with the Economic Policy team at the Center.